Some of the biggest names in finance are fighting for control of the London gold market — a $5 trillion, three-century-old trading hub that is being forced to adapt to a digital age. As the London Bullion Market Association revamps over-the-counter trades that are the market’s major pricing benchmark, new ways of buying and selling precious metals are set to start next year from CME Group Inc., Intercontinental Exchange Inc. and the London Metal Exchange. Some big banks have stakes in the outcome, including Goldman Sachs Group Inc., HSBC Holdings Plc and JPMorgan Chase and Co. 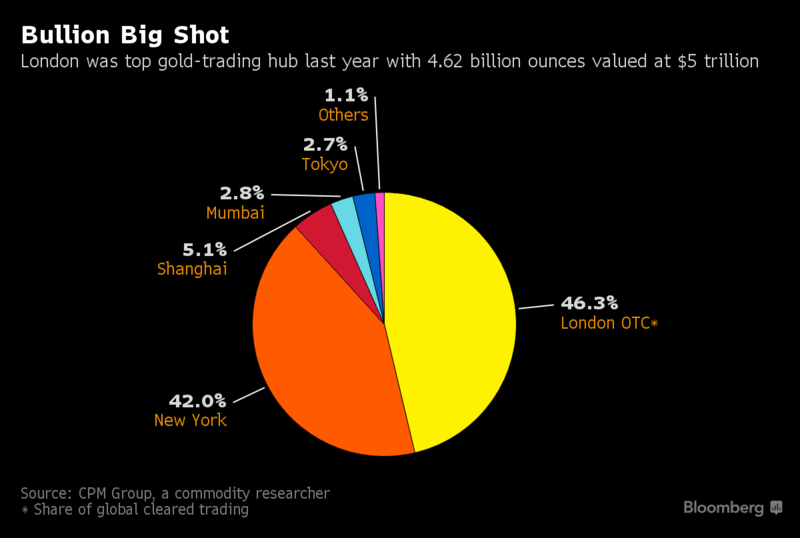 Almost half the world’s known gold trading occurs in London. OTC transactions are sealed by virtual handshakes, leaving default risk with buyers and sellers rather than relying on clearinghouses, which use collateral to manage and offset risk. But since the financial crisis, all markets have been reevaluating how they do business and manage risk as regulators step up scrutiny. That’s particularly true for major price-setting exchanges, after it was discovered in 2012 that banks were manipulating a key benchmark for global interest rates. A push for fewer risks and more disclosure has forced the LBMA to seek changes that would make it more transparent and secure for customers. The association, which counts HSBC and JPMorgan among its members, will introduce trade reporting for its members and a new trading platform in the first half of next year. That’s also when competitors plan to unveil new precious-metals derivatives built around the clearinghouse models. Gold remains one of the world’s most-popular commodities and a core reserve for central banks around the world. While prices slumped for three straight years through 2015, demand has since rebounded. Holdings by exchange-traded funds are up 30 percent this year, and investors have poured a net $25.5 billion into precious metals funds, data compiled by Bloomberg show. That’s helped boost the business of buying and selling gold. In October, LBMA reported gold trading rose to a daily average of 18.6 million ounces. That’s about $23.5 billion, based on the average value of bullion for the month. Prices are up 9.6 percent this year at $1,162.56 an ounce. The LME, the world’s largest base-metals exchange, found so much promise in precious metals that it announced in August plans to start offering cleared gold and silver contracts in the first half of 2017. Eventually, it will add platinum and palladium. The exchange had the backing of a group of five banks including Goldman Sachs, ICBC Standard Bank Plc and Societe Generale SA, as well as the World Gold Council, a group backed by the mining industry that seeks to develop markets for the metal. ICE, which owns commodity and financial exchanges, already runs the daily London gold auction on behalf of the LBMA among 13 authorized participants who set the daily price. In October, the Atlanta-based company said it would start its own gold contract in February that would involve bullion held in London and traded on its New York exchange. Chicago-based CME Group, owner of the Chicago Board of Trade and the world’s largest futures exchange operator, sought an even earlier entree into the London marketplace. In November, during LME Week, CME said it would start London gold and silver contracts Jan. 9 that offer a spread between spot prices and benchmark U.S. futures. Senior traders, including Biondi and Simon Grenfell, global co-head of commodities at Natixis SA, an LBMA member bank which offers trading and risk management services, said the change is both necessary and inevitable. Opinion remains split on who will come out on top. Dobra, Biondi and founding member Raj Kumar, head of precious metals business development at ICBC Standard Bank, all said the LME offers the best solution for the market. Brad Yates, trading head for Dallas-based refiner Elemetal LLC, said the CME would best fit his business needs. And participation on ICE’s benchmark, which underlies its contract, keeps growing, with trading house INTL FCStone Inc. the latest to join the process. 1oz – It is rarer to find a one ounce nugget of gold than a five carat diamond. 90% – Over 90 per cent of the world’s gold has been mined since the California Gold Rush.